This is Project Catapult, constructed by the M+W Group. 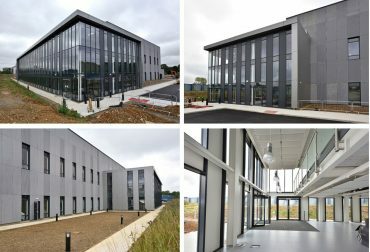 The building houses a major new, world-class research and manufacturing facility and is located in Stevenage. The new facility is able to manufacture late phase clinical trials and early supplies of the most advanced therapeutic medicinal products (ATMP’s) including cell and gene therapies. This fantastic looking building was designed by Fairhursts Design Group and incorporates over 1,000m2 of curtain wall and entrance screens. The curtain walling grid includes a combination of capped and capless curtain walling in order to give the building design a vertical emphasis. Technals MX curtain walling suite was used throughout the facade design. For further project information and images, please click HERE.